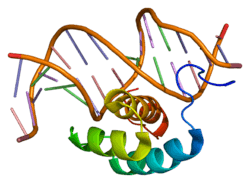 Homeobox protein Hox-B7 is a protein that in humans is encoded by the HOXB7 gene. This gene is a member of the Antp homeobox family and encodes a protein with a homeobox DNA-binding domain. It is included in a cluster of homeobox B genes located on chromosome 17. The encoded nuclear protein functions as a sequence-specific transcription factor that is involved in cell proliferation and differentiation. Increased expression of this gene is associated with some cases of melanoma and ovarian carcinoma. HOXB7 has been shown to interact with PBX1 and CREB-binding protein. ↑ Scott MP (December 1992). "Vertebrate homeobox gene nomenclature". Cell. 71 (4): 551–3. doi:10.1016/0092-8674(92)90588-4. PMID 1358459. ↑ "Entrez Gene: HOXB7 homeobox B7". ↑ Chang CP, Shen WF, Rozenfeld S, Lawrence HJ, Largman C, Cleary ML (March 1995). "Pbx proteins display hexapeptide-dependent cooperative DNA binding with a subset of Hox proteins". Genes Dev. 9 (6): 663–74. doi:10.1101/gad.9.6.663. PMID 7729685. ↑ Chariot A, van Lint C, Chapelier M, Gielen J, Merville MP, Bours V (July 1999). "CBP and histone deacetylase inhibition enhance the transactivation potential of the HOXB7 homeodomain-containing protein". Oncogene. 18 (27): 4007–14. doi:10.1038/sj.onc.1202776. PMID 10435624. Baier LJ, Hannibal MC, Hanley EW, Nabel GJ (1991). "Lymphoid expression and TATAA binding of a human protein containing an Antennapedia homeodomain". Blood. 78 (4): 1047–55. PMID 1678287. Peverali FA, D'Esposito M, Acampora D, Bunone G, Negri M, Faiella A, Stornaiuolo A, Pannese M, Migliaccio E, Simeone A (1990). "Expression of HOX homeogenes in human neuroblastoma cell culture lines". Differentiation. 45 (1): 61–9. doi:10.1111/j.1432-0436.1990.tb00458.x. PMID 1981366. Giampaolo A, Acampora D, Zappavigna V, Pannese M, D'Esposito M, Carè A, Faiella A, Stornaiuolo A, Russo G, Simeone A (1989). "Differential expression of human HOX-2 genes along the anterior-posterior axis in embryonic central nervous system". Differentiation. 40 (3): 191–7. doi:10.1111/j.1432-0436.1989.tb00598.x. PMID 2570724. Shen WF, Largman C, Lowney P, Corral JC, Detmer K, Hauser CA, Simonitch TA, Hack FM, Lawrence HJ (1989). "Lineage-restricted expression of homeobox-containing genes in human hematopoietic cell lines". Proc. Natl. Acad. Sci. U.S.A. 86 (21): 8536–40. doi:10.1073/pnas.86.21.8536. PMC 298317 . PMID 2573064. Simeone A, Mavilio F, Acampora D, Giampaolo A, Faiella A, Zappavigna V, D'Esposito M, Pannese M, Russo G, Boncinelli E (1987). "Two human homeobox genes, c1 and c8: structure analysis and expression in embryonic development". Proc. Natl. Acad. Sci. U.S.A. 84 (14): 4914–8. doi:10.1073/pnas.84.14.4914. PMC 305217 . PMID 2885844. Lill MC, Fuller JF, Herzig R, Crooks GM, Gasson JC (1995). "The role of the homeobox gene, HOX B7, in human myelomonocytic differentiation". Blood. 85 (3): 692–7. PMID 7530503. Chang CP, Shen WF, Rozenfeld S, Lawrence HJ, Largman C, Cleary ML (1995). "Pbx proteins display hexapeptide-dependent cooperative DNA binding with a subset of Hox proteins". Genes Dev. 9 (6): 663–74. doi:10.1101/gad.9.6.663. PMID 7729685. Corsetti MT, Levi G, Lancia F, Sanseverino L, Ferrini S, Boncinelli E, Corte G (1995). "Nucleolar localisation of three Hox homeoproteins". J. Cell. Sci. 108 (1): 187–93. PMID 7738096. Inamori K, Takeshita K, Chiba S, Yazaki Y, Hirai H (1993). "Identification of homeobox genes expressed in human T-lymphocytes". Biochem. Biophys. Res. Commun. 196 (1): 203–8. doi:10.1006/bbrc.1993.2235. PMID 8105782. Caré A, Silvani A, Meccia E, Mattia G, Stoppacciaro A, Parmiani G, Peschle C, Colombo MP (1996). "HOXB7 constitutively activates basic fibroblast growth factor in melanomas". Mol. Cell. Biol. 16 (9): 4842–51. doi:10.1128/mcb.16.9.4842. PMC 231486 . PMID 8756643. LeBrun DP, Matthews BP, Feldman BJ, Cleary ML (1997). "The chimeric oncoproteins E2A-PBX1 and E2A-HLF are concentrated within spherical nuclear domains". Oncogene. 15 (17): 2059–67. doi:10.1038/sj.onc.1201367. PMID 9366523. Stelnicki EJ, Kömüves LG, Kwong AO, Holmes D, Klein P, Rozenfeld S, Lawrence HJ, Adzick NS, Harrison M, Largman C (1998). "HOX homeobox genes exhibit spatial and temporal changes in expression during human skin development". J. Invest. Dermatol. 110 (2): 110–5. doi:10.1046/j.1523-1747.1998.00092.x. PMID 9457903.